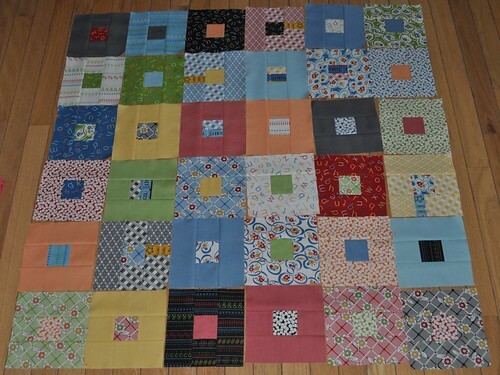 This is almost half of my Punctuation jelly roll, all sewn up into these super easy blocks. I like making these because there isn't a lot of thinking involved, and they are very quick to make. Especially when you cut 4 blocks at a time. I will probably finish the rest of them in the next week or so and put together the quilt top. And this will be the first time I've bought a jelly roll and used the whole thing up. So far. I have also felt the need to make some improvised scrap blocks. I have my scraps organized by color in big ziplock bags, and I had a little baggie full of those triangles that are left over when I make quilt binding. I decided to make some stars. And one shoo-fly block. I did something different with these--I only used scissors for any cutting that was necessary while I was making them. I have noticed a few quilts or quilt blocks made this way on flickr and have wanted to try it. These blocks aren't trimmed or squared up yet, and maybe I won't square them up, really, but I think they do have a little more organic, homemade look than blocks cut with a ruler and rotary cutter. 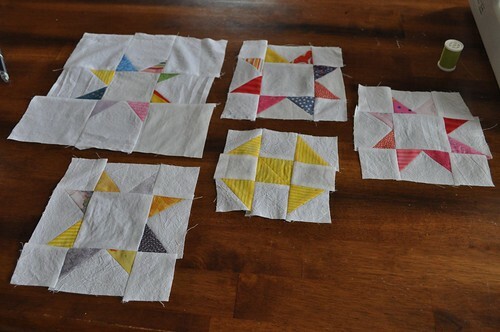 My plan for these is to make a kind of scrappy improv quilt, maybe a row quilt. It's something I plan on taking my time with; I'm only making blocks when I want to and I have no plans for when it needs to be finished. And now for my little announcement... in the next few days, this little blog will be having its 5th birthday! As a thank you to my readers, I will be having 5 days of giveaways, starting this Friday, April 1. I think you will like them. I hope so! See you then! Love your little improv blocks. It's like Gwen Marston's parts department. Then....too small, ad some - too big, cut some off. She's so fun! Love those blocks...looks like something I definitely would try! Happy Anniversary! Five years is great. Wow, five years! Good job! Fun blocks and congratulations on 5 yrs!